The residential market vertical spans multiple types of dwelling, categorized by varying footprints and ownership structures (Single family, multi-family, detached, condominium, apartments, etc…). 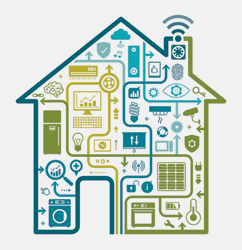 Although the level of IoT penetration and complexity varies by the type of dwelling, the application space targets the same goals. Efficiency and convenience IoT functionality is implemented by combinations of sensing, monitoring, automation (control) and notification. The application covers systems that include lighting, security, HVAC, power delivery, entertainment and is increasingly extending into appliances and fixtures of all types. A mesh network is a network topology in which each node relays data for the network. A wireless personal area network technology designed and marketed by the Bluetooth Special Interest Group intended to provide considerably reduced power consumption while maintaining a similar communication range as Bluetooth. A technical standard which defines the operation of low-rate wireless personal area networks. 4G short for fourth generation, is the fourth generation of wireless mobile telecommunications technology. A standard for high-speed wireless communication for mobile phones and data terminals, based on the Global System for Mobile Communications (GSM)/Enhanced Data rates for GSM Evolution (EDGE) and Universal Mobile Telecommunications System (UMTS) /High Speed Packet Access (HSPA) technologies. A smart speaker developed by Amazon which connects to the voice-controlled intelligent personal assistant service Alexa. A complex of three devices (a speaker, the Al personal assistant, and the smart controller), all in one.